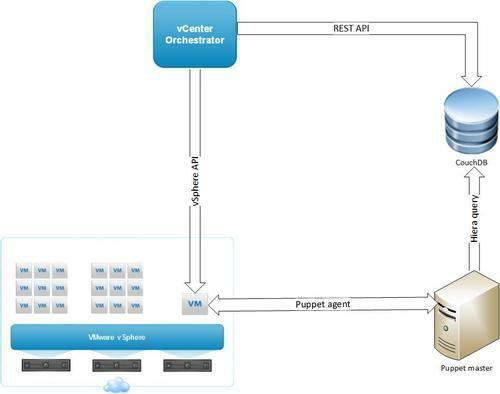 Today I’m excited to describe how I have integrated vCenter Orchestrator (vCO) and Puppet. I’ve been working with vCO for several months now and there are several ways you can integrate it with Puppet to provision Virtual Machines. The first requirement is vCO itself, which is luckily free with vSphere Enterprise. Secondly you’ll need a Puppet master (Open Source or Enterprise) using Hiera. Hiera is a fantastic tool to separate your business logic from your configuration data, more information here. So how does the Puppet integration work? Well there are multiple options to do this. You can fork over a lot of money for VMware vCloud Automation Center (vCAC) and Puppet Enterprise and get out of the box integration, detailed here. You can also use static JSON files as a Hiera source and write to them via vCO, but this is clunky and error prone (what happens if multiple workflows try to change the same file at once?). Luckily I stumbled upon a hiera backend plugin called hiera-http (if you’re going to use this be aware there’s a bug with false values being returned as nil, which I’ve submitted a pull request for here. It’s fairly simple to patch your local installation). The author gives an example on how to configure hiera to retrieve data from a CouchDB NoSQL database here. CouchDB is perfect for our purposes because it natively supports REST (in fact it’s the only API it supports) and JSON data! Not only can you provision and decommission hosts, you can also instrument vCO workflows that modify the Hiera data for you, avoiding the need for IT staff to manually update flat files. It creates a single entry point for all change which is highly configurable, failure resistant and easy to use.